In the Shadow of the Hiawatha: CP Rail’s Former Milwaukee Road at Wyocena. Trains Magazine’s Brian Schmidt and I were making the most of sunny frosty weather in central Wisconsin. We arrived at Columbus to refuel. 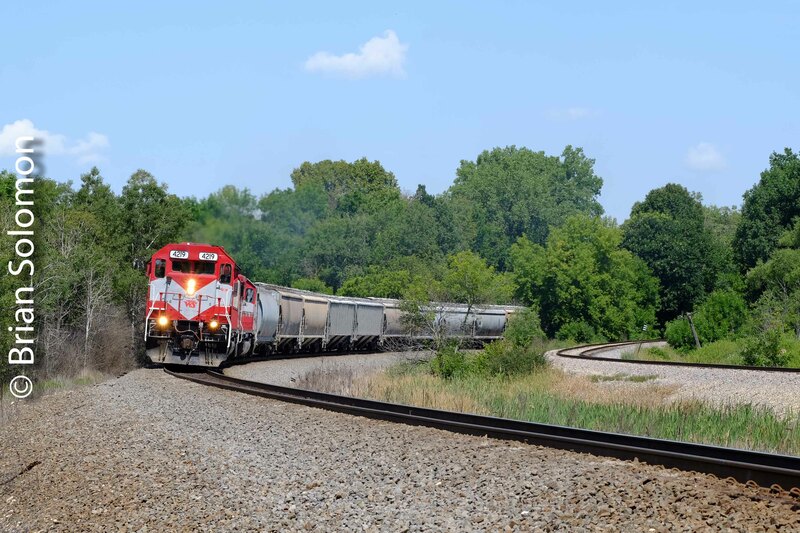 Upon exiting the gas station, we spotted a westward CP Rail train making its way over the old Milwaukee Road mainline. Soon we were in rapid pursuit. I navigated using my iPhone and we found our way to an open crossing near Wyocena. As we waited for our westward freight, I imagined what it would have been like to see Milwaukee’s famous streamlined Hiawatha race through at 100 plus mph. Wow. That would have been exhilarating. An Otto Kuhler styled 4-6-4 in yellow, orange, gray and maroon. Before my time . . . So we happily settled for a BNSF former Santa Fe SD75M leading two CP Rail units on a long drag freight. Photo exposed using a FujiFilm XT1 with 18-135mm pancake lens; ISO 400, Velvia Color Profile. We were rewarded by a following westward freight a few minutes later, and then an eastbound! Union Pacific Adams Line on January 20, 2019. It was bitterly cold and clear when Chris Guss, Brian Schmidt and I set out to photograph the former Chicago & North Western Adams Line—the late-built ‘Adams Cut-off’ that shortened the distance between Milwaukee and the Twin Cities. We drove back roads from Waukesha to Clyman Junction, the location of a surviving steam-era coaling tower. Then we explored various potential photo locations. Looking east near Beaver Dam, Wisconsin. Train movements on the Adams Line can be infrequent, but patience paid off, and by mid-morning we caught an eastward train in nice light. The clean SD70M was an added bonus. I made both color slides and digital photos. The slides remain latent, so here are some of the digital images. Exposed using a FujiFilm XT1 with 18-135mm Fujinon zoom. Empire Builder, Bloody Nose and a Snow Squall. Friday afternoon January 18, 2019, Trains Magazine’s Brian Schmidt and I visited Duplainville, Wisconsin to catch Amtrak’s westward Empire builder, train number 7, as it split the signals in a snow squall. I was delighted to see that the Milwaukee Road-vintage searchlight signals that I remember from my days in Wisconsin (now more than two decades ago) are still active. The third locomotive in the Builder’s consist was the elusive Amtrak 156, ‘the bloody nose’—so named for its wearing of the 1970s-era Amtrak paint scheme. I exposed these views using my FujiFilm X-T1 with 90mm f2.0 telephoto. White balance set to ‘daylight’. Local photographers had gathered for Amtrak’s daily passing. Amtrak 156 is one of several ‘heritage’ locomotives wearing paint schemes from years gone by.. Parallel Lines: Wisconsin & Southern Left and Right at Ackerville. Parallel lines. 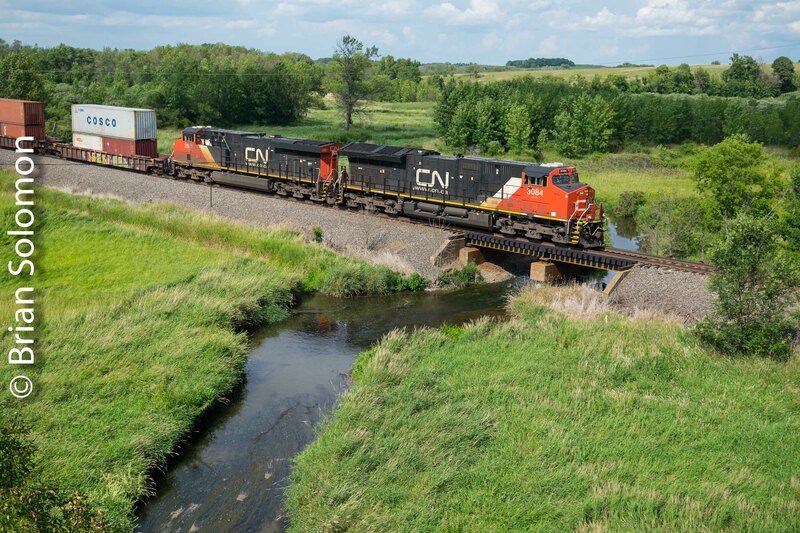 On the left is Canadian National’s Wisconsin Central line from Fond du Lac to Chicago; on right is Wisconsin & Southern’s former Milwaukee Road line running from Horicon to Milwaukee. 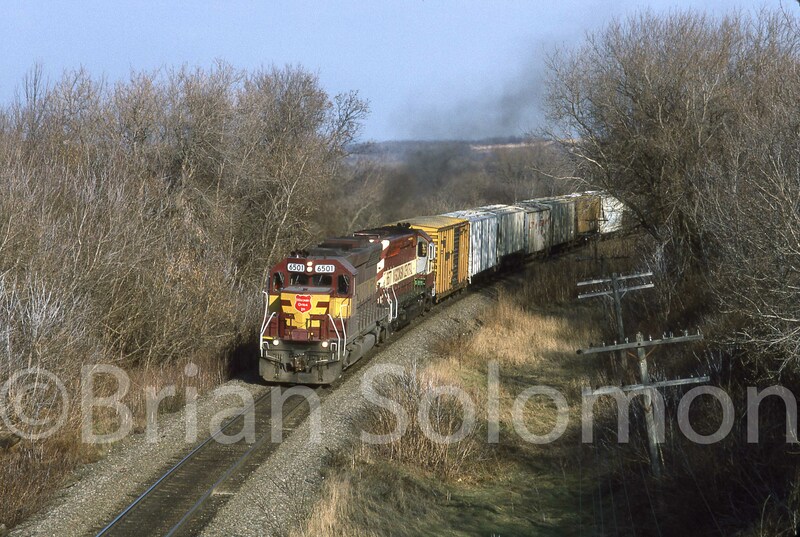 On this day, Chris Guss and I were aiming to catch Wisconsin & Southern’s T-4 freight on its way to Janesville. 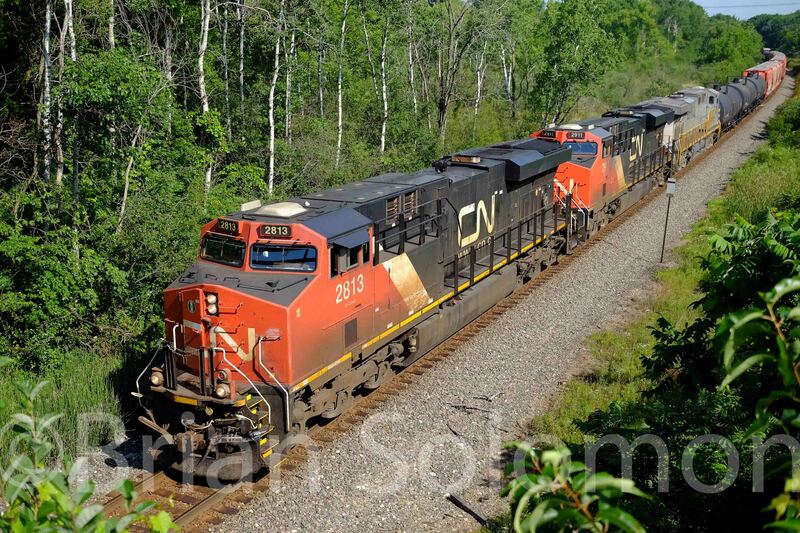 This train joins CN’s route at Slinger, just a little ways north from our location in the curve at Ackerville. 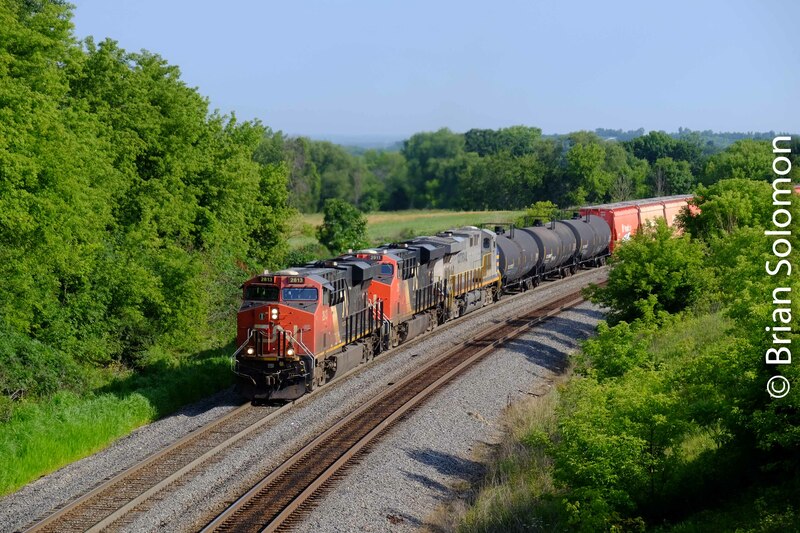 My goal was to show the parallel routes, while featuring the freight accelerating through the curve, to demonstrate the power of the locomotives. Complicating my composition were the rows of trees. When I place the train in the distance, the tops of the locomotives are below the tree-line, and the thus less dramatic. When I let the locomotives get closer, they obscure the freight cars and most of the interesting effects of the parallel curves. Tight 90mm view. How do you like the fluffy cloud above the engines? If I move lower, the angle would be more dramatic, but the second set of tracks would be nearly lost altogether. Longer focal length lens? Similar quandary, this minimizes the second set of tracks and features the trees more prominently. 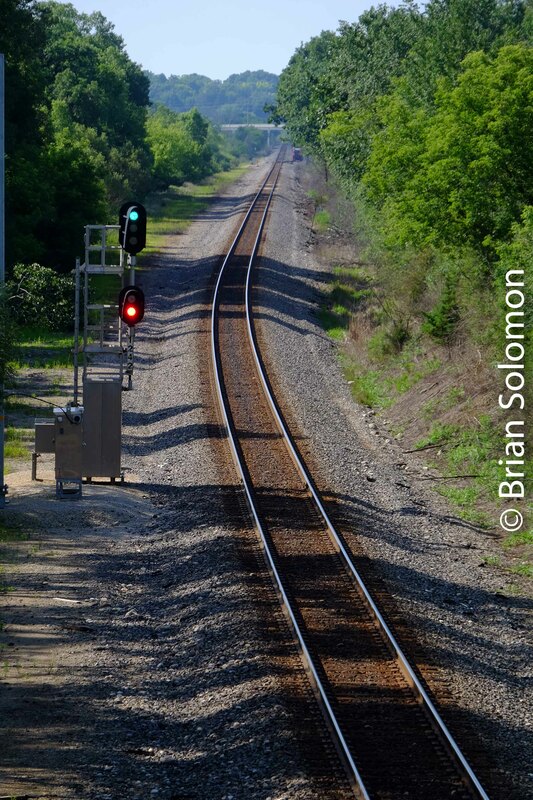 Such are the challenges of perfecting railroad photo composition. Often there’s no one ideal solution. Vestige of the Chicago & North Western. In July (2017), John Gruber and I visited the old Chicago & North Western at Jefferson Junction, Wisconsin. I was surprised to find that the railroad’s old mailbox remained. It has been more than 22 years since the old C&NW was absorbed by Union Pacific. In 1995 at the end of C&NW’s independent operations I’d made photos of this same mailbox, which for me served as a symbol of the railroad. Now it’s a faded vestige of another era. More than just the paint has changed. Exposed using a FujiFilm X-T1 digital camera with 18-135mm lens. Lumix LX7 photo at Jefferson Junction, Wisconsin. Eastward at Merrimac on the old North Western—lighting challenge; one file and four results. Here’s a lighting challenge: A freight train crossing a big bridge against an overcast sky. Expose for the train and the sky gets washed out (loss of detail). Expose for the sky and the train is too dark. I expose for the sky and then adjust the file in post processing. Why? Because it is easy enough to lighten slightly underexposed areas, but once highlight detail is lost through over exposure it cannot be recovered. To balance the exposure in post processing, I lightened the shadow areas globally. This took all of about 30 seconds to accomplish in Lightroom. I also made minor adjustments to overall color balance and saturation. Afterwards, I played with the file to make some outlandish versions for point of comparison. Of the four, the second from the top is the only image I’d normally present. The bottom of the four is intended to be a little absurd. This is an unadjusted JPG scaled from the camera RAW file. In other words, I did not interpret the data, assign color profile, or otherwise alter the appearance of the image. Wisconsin Southern’s Reedsburg-Madison freight at the Lake Wisconsin Bridge at Merrimac. This is my adjusted file; using Lightroom, I’ve made nominal adjustments to lighten shadows and improve color balance and saturation in order to make for a more realistic and appealing photograph. For the giggles I made more dramatic alterations to the camera RAW file in this example. Without consideration for realism, I’ve darkened the sky using a digitally applied graduated neutral density filter, pumped up the color saturation and wildly altered the color balance using various controls in Lightroom. This sort of extreme effect is often applied to photos appearing on the net. I’m not a huge fan of candy-cane coloring, but it certainly seems popular and it is easy enough to accomplish. Here I’ve pushed the limits a little further. All in the name of distorting the image. Incidently, while the original RAW file remains unchanged, the effect of these extreme changes to the JPG output has the effect of compressing the image and results in loss of data that may make the JPG difficult to print the image in a book or magazine. Also the way this appears on your screen may be very different from how I see the image on mine. Mainline now Branchline—Wisconsin & Southern to Reedsburg, Wisconsin. 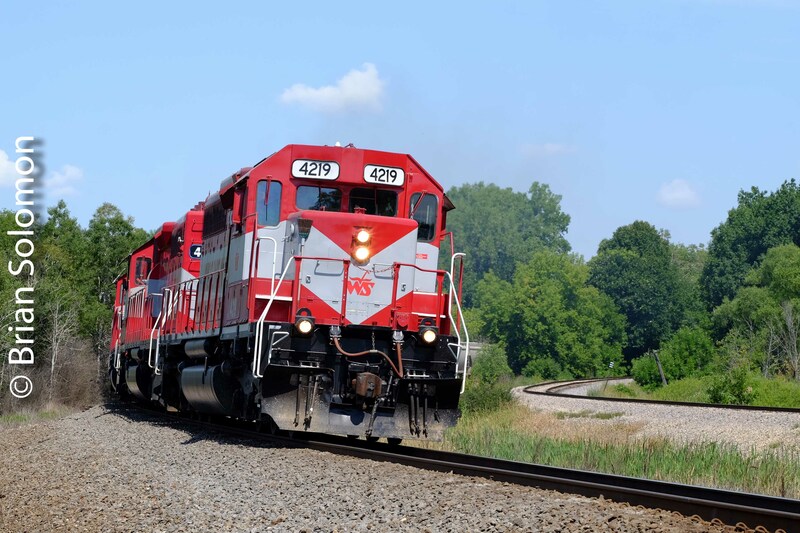 A couple of weeks ago, I traveled with Rich and John Gruber to photograph Wisconsin & Southern’s Reedsburg to Madison freight. This plies a former Chicago & North Western route that in its heyday a century ago was a double-track mainline running from Chicago to the Twin Cities via Elroy. Today, it is a ambling branch line with lots of 10 mph running: No directional double track, no signals, no fast passenger trains, and the line is truncated at Reedsburg. On this day a matched set of back to back SD40-2s was an added attraction. We decided on Hatchery Road in Baraboo as our first photo location. I opted to feature the skewed rural grade crossing. Exposed with a FujiFilm X-T1 fitted with an 18-135mm zoom lens. File manipulated in post processing to balance exposure and improve color balance. Compare the contrast and color balance between this image and the others. Notice subtle differences and see how the alter the appearance of the locomotives in their environment. This view features a cooler color-balance (tends more toward the blue). Adjustments to contrast of the middle tones using the ‘clarity slider’ in Lightroom resulted in greater separation between the red and silver on the locomotive stripes. To balance the exposure, I manipulated the camera RAW files in Lightroom using digitally applied graduated neutral density filter to better hold sky detail, while lightening shadow areas and making slight adjustments to overall contrast and color balance. A low angle can make for a more dramatic image. Maybe this is why that at an early age some of us were so impressed by trains to begin with? I made this view at East Troy, Wisconsin on September 3, 1994 using my Nikon F3T with an AF f2.8 28mm Nikkor lens. Kodachrome 25 was my preferred emulsion at that time. This view is full-fram and un-cropped. I made a few color correction and contrast adjustments in Lightroom to improve presentation here. Wisconsin & Southern wide-angle view. Wisconsin & Southern at Reedsburg, Wisconsin in July 2016. Exposed using a FujiFilm XT1 with 12mm Zeiss Tuoit lens. Abandoned Illinois Central Tunnel-Belleville, Wisconsin. It was 20 years ago that my brother and I explored the setting of the abandoned former Illinois Central tunnel at Belleville, Wisconsin. I made this image on Fujichrome Provia100 using my Nikon F3T mounted on a Bogen 3021 tripod near the north portal. Outside it was a dull afternoon, which helped provide more even lighting inside the old bore. At one time the wig wag signal was the standard grade crossing protection. Now the type is all but extinct. I learned a few weeks ago that Wisconsin & Southern had finally removed the last of these classic American signals on its former Chicago & North Western line to Reedsburg, which had survived at Baraboo, Wisconsin. Over the years, I’d photographed wig wags at various locations in Wisconsin. I made these photographs at Baraboo with John Gruber in February 2008. Using a Canon EOS3 with 20mm lens, I used a relatively slow shutter speed to help convey the classic motion of the wig wag signal. Fujichrome slide film. Brian is Traveling, so Tracking the light is on Autopilot! DAILY POST: Wisconsin & Southern at Avalon. Avalon is at the heart of Arthurian myth. And, as it happens, it’s also on Wisconsin & Southern’s former Milwaukee Road Line between Janesville and Chicago! No knights in armor here, nor Merlin, nor Lady of the Lake; just a matched set of SD40-2s in clean paint leading a long freight and tall late season grasses blowing gently in the wind. A few hours earlier I’d met up John Gruber at the Janesville Roundhouse and we spent a pleasant afternoon photographing this freight. We had a fair wait at Avalon before the train came into view. Exposed with a Canon EOS 7D with 200mm lens. ISO 200. This photo is among my favorite from the day. I used a long lens to compress the locomotives while setting the grass in the foreground out of focus. I also made a closer view on Fujichrome film.